In these days of ultra-modern stream-lined licensed premises, where everything but the glasses appear to have chromium fittings, it is refreshing to find an old building treated with imagination and respect for its original architecture. 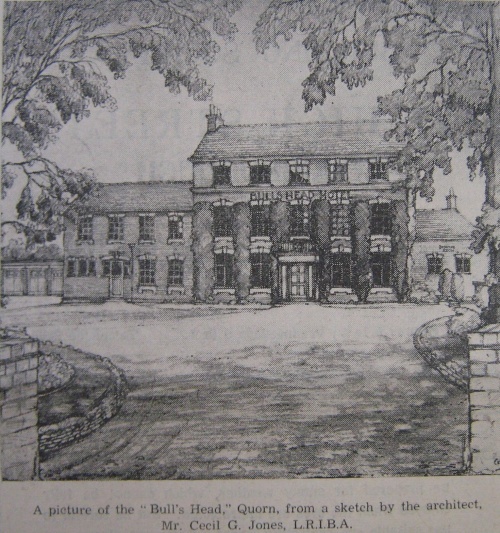 Such a building is the Bull's Head Hotel, Quorn, once an old coaching house called "The Swan with Two Necks." For many years, until 1919, the building was known as Quorn Place and was a private residence. It was then acquired by Mr James A Hartopp, MBE., and for some time was let as a nursing home. Now, through the enterprise of Mr Hartopp, the building has undergone a metamorphosis, but the traditional Georgian line have been maintained with the result that Quorn has now a dignified hotel, preserving a genuine memory of the olden days, but with a modern adaptation of service and amenities, equal to any such place in the Midlands. The property is very old and an oak beam was discovered in the cellar upon which is carved the date 1742. Part of the building at least dates back prior to then, as during alterations made during the past few months, a bundle of ancient papers was found in one of the beams, the ink on which appears to have formed part of a record of transactions kept by "mine host" of the inn, and which bears the date 1730. At the foot of the garden at the rear of the property, there is an old square tower covered with ivy which it is understood in the old coaching days was used as a look-out tower from which the approach of the stage-coach could be seen in the distance, and the good lady of the inn wanted to prepare a meal and other refreshment for hungry travellers. From this tower one can obtain a wonderful view of the surrounding countryside. Also in the garden, of great interest to horticulturists, is a tall Gingko tree, or what is known as a maidenhair fern tree, belonging to the Coniferae species. This is over 200 years old and of considerable value. It is probably the tallest in the country, Gingko trees of this height being very rare in England. The property has been completely redesigned and modernised to fulfil the requirements of an up-to-date roadside hotel, without sacrificing its pleasing early Georgian exterior. The architecture of the main portion of the premises has been left practically unchanged, and subsequent additions made as far as possible to blend harmoniously with the original structure. A completely new left wing has been added; the original dining room has been pulled down, and the present dining room embodied in a new right wing at the rear of the property. The room has been rebuilt in old oak panelling, with an old fashioned fireplace at each end. Facing south, a pleasant view of the lawn and gardens is obtainable from windows opening on to a stone-flagged terrace running the whole length of the wing. In striking contrast are the spacious modern kitchens, their white tiles and shining appliances conveying an atmosphere at once hygienic and efficient. Previously there was no drainage system, but a completely new system has been installed. Apparently the "Swan With Two Necks" drew its water supply from a well, which was found under a passage-way in the kitchen, over 50 feet deep, which has now been filled in and built over. Every brick in the new building is a hand-made Leicestershire brick and they have been specially sorted from old cottages and other buildings, and the roofs are of selected Swithland slates. In keeping with modern times, the old stables used during coaching days have been converted into modern lock-up garages. The cellars are practically as they were originally, and are excellently constructed for the storage of beers and wines, the old thrawls having been kept almost in their entirety. It is realised that although notwithstanding the attractions of such an interesting, old-world atmosphere, the traveller of today demands bodily comfort, and the hotel is thoroughly fitted with modern furnishings and up-to-date equipment; each bedroom possesses a hot and cold water supply, with modern furniture and comfortable beds. ; there is adequate bathroom accommodation, and from each bedroom window, a pleasing view greets the eye. The hotel is fully licensed, and there are the usual public rooms, all comfortably appointed. A large, semi-circular gravel drive at the front of the property affords a magnificent spacious pull-in for cars. The aim throughout has been to fulfil a long felt want in providing "something different" for travellers requiring "something different", and the special needs of passing motor traffic have particularly been borne in mind. The architect is Mr Cecil G Jones LRIBA, AIAS., of the En-Tout-Cas Coy., Ltd., Syston. Miss Rowlands has been appointed manageress.